On our 2014 mission trip to Tanzania, we worshiped on Sunday in a church in the Shinyanga district. About five people came forward for baptisms including an pretty baby girl. I noticed that the person that brought her forward looked older than the typical mother. When she returned to her seat, I admired the baby so she handed me the infant to hold for the remainder of the service. The baby was just precious and sat staring at my hair and mazungo skin color and kept touching my straight hair. She was so sweet. And the best part is that she did not wet on me as babies do not wear diaper here and I am often christened. I held her through the service and while we processed out behind the pastor. We stood out in the yard after the church and participated in the auction of items placed in the offering that was not money. One of the church ladies came up to me and asked if I wanted to take the baby, whose name I was told, was Gloria back to America and raise her. If I could, I would I answered but I am too old and the government would never allow it. While we sat around visiting under a tree waiting for the truck to come back for us, I continued to hold Gloria wondering where her mother was. A young girl came and sat next to me. She was a teenager. Are you the momma I asked ?. No she was the aunt. The mother had died and the father was not in the picture. She was being cared for by the grandmother who was now gravely ill herself. Knowing that the babies are nursed, I asked who was nursing her. No one answered the aunt who I found out was 17. Gloria does not get milk as purchased milk was very expensive. They are feeding her porridge and water. When Gloria finally got fussy, I handed her back to her aunt who pulled out a cup with a watery porridge in it. She slowly and with great care fed the baby from the cup until Gloria consumed all of it. I was quite impressed with how she did this. Gloria was clean and looked well cared for. 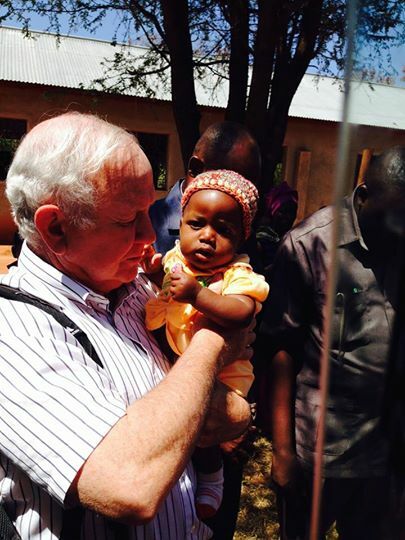 Bob Allen heard the conversation and decided to take up an offering among the missionaries to purchase milk for Gloria. We were blessed to do it. Gloria will be cared for as best they can in the extended family which is the case when the parent (s) dies. Someone had the presence of mind to bring her to church for baptism. The pastor told us that the aunt, as young as she is, is an assistant evangelist. Later in the week, we showed the picture of Gloria to Lillian Makala, the wife of the bishop. She recognized her and said the grandmother had been her mid wife for delivering one of her children. Small world. God bless Gloria and her caregivers.